Have the capacity to read, write and communicate in English with comprehensive level on technical documentation. At the end of the courses, the trainee will perform a type rating skills test and flight assessment in compliance with the training syllabus. The applicant should demonstrate the required skills for the safe operation of the applicable type of helicopter. After successful course completion, the trainee will be awarded an AHTS certificate. The Aircraft Maintenance Technician (AMT) course is designed to provide aircraft maintenance technicians with the knowledge and necessary skills to maintain the whole mechanical and avionics systems of the NH90 TTH. It combines both theoretical instruction and practical training. The contents of the training courses are, as far as applicable, in accordance with the standards as specified by the EASA PART 66 regulations. The Aircraft Maintenance Technician (AMT) course is designed to provide aircraft maintenance technicians with the knowledge and necessary skills to maintain the whole mechanical and avionics systems of the NH90 NFH. It combines both theoretical instruction and practical training. The contents of the training courses are, as far as applicable, in accordance with the standards as specified by the EASA PART 66 regulations. The Aircraft Maintenance Technician (AMT) course is designed to provide aircraft maintenance technicians with the knowledge and necessary skills to maintain the whole mechanical and avionics systems of the TIGER. It combines both theoretical instruction and practical training. The contents of the training courses are, as far as applicable, in accordance with the standards as specified by the EASA PART 66 regulations. The Refresher course updates knowledge and proficiency to operate NH 90 TTH with a high level of safety and great efficiency. This course reviews the main subjects of the relevant theoretical type rating course. The course content may be designed according to customer’s request. The Refresher course updates knowledge and proficiency to operate NH 90 NFH with a high level of safety and great efficiency. The Refresher course updates knowledge and proficiency to operate a Tiger helicopter with a high level of safety and great efficiency. 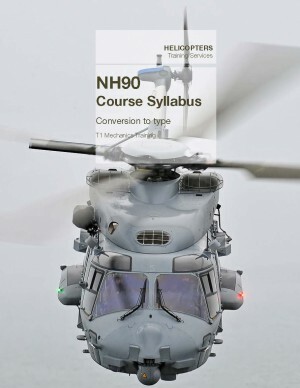 The objective of the familiarisation course is to provide general information and understanding on the NH90 aircraft, mission and weapon systems, on the helicopter’s capabilities as well as awareness of general safety requirements related to the helicopter’s operations and maintenance. At the completion of the familiarisation course, the trainees will have a general knowledge of the NH90 helicopter and its related systems. Have the capacity to read, write and express in English with comprehensive level on technical documentation. The Line Service Technician course provides knowledge and proficiency to carry out ground support to the aircraft with a high level of safety and great efficiency, as well as assisting the aircrew during pre-flight and post-flight operations. An English test is available on the Learner Portal, free of charge for the customer (strongly recommended). The Maintenance Supervisor course provides the Aircraft Maintenance Supervisor with the knowledge and necessary skills to manage and supervise maintenance on NH90 or Tiger aircraft. The “Hands-On Maturity and Enhancement” (HOME) training is designed to prepare Aircraft Maintenance technicians through training and performance testing, conducted by qualified NH 90 and Tiger instructors in the working Line Maintenance environment. It provides practical hands-on experience and has the advantage of providing training on tasks which meet the immediate needs of a technician. This training program dedicated to Standard Practice Enhancement is proposed to the all Airbus Helicopters range. It is based on a Structured On-the-Job-Training process that defines final objectives.